Waverly Sun N' Shade Bits and Pieces Seaglass Indoor/Outdoor Rug - 4'3" x 6'3"
Waverly Sun N' Shade Bits & Pieces Seaglass Area Rug by Nourison - 5'3" x 7'5"
Waverly Sun N' Shade Bits & Pieces Seaglass Area Rug by Nourison - 7'9" x 10'10"
Sun-n-Shade Collection by Waverly offers a fresh perspective on indoor/outdoor rugs. The exciting color palettes and myriad designs add a timeless quality to Waverly's keen sense of today's style. 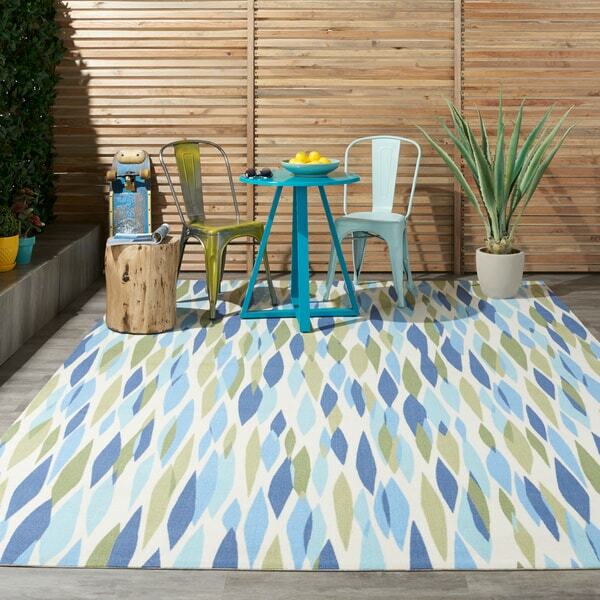 These versatile outdoor rugs are ideal for patio and poolside alike, and can withstand almost all outdoor conditions. An overlapping myriad of multicolored diamond shapes grace this smart, modern Waverly Bits & Pieces rug by Nourison. A palette of denim, aqua, soft cream and olive green makes this rug the perfect piece to go poolside, on the patio, or in an interior space. Dense, overlapping shades of blue and green on a cream white field. Easy cleaning and maintenance - just rinse with hose and air-dry. Stands up to heavy-traffic areas inside or out. Pile height is .25 inches. Nourison draws from over 35 years of craftsmanship knowledge to deliver bold, stylish area rugs and decor for your home. Click here to shop more. Dimensions 93.0 In. X 93.0 In. X 0.25 In. 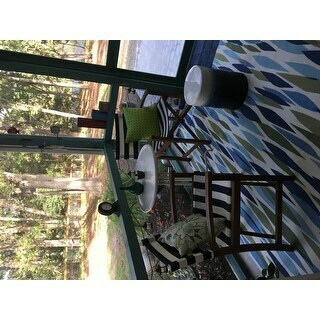 This was the perfect rug for my back screened in porch. All of the colors are true to the photos. It was perfectly square with no defect. I like that it is not thick but yet built with quality. We purchased this rug for our outdoor patio. It is a good size and shape and the colors are fresh and vibrant. The rug itself is thin (fine for an outdoor rug) but looks to be made well overall. As a previous reviewer mentioned there is an odor to this rug. I do not find it particularly strong, but did notice it when unrolling the rug for the first time and once or twice while sitting on the patio. I think it will dissipate fairly quickly. The one big complaint I have is that after a few days on the patio this thing is still not laying flat. Both edges are curled up and seem to be in no hurry to flatten. Perfect accent for any space. This carpet completely livened up my outdoor patio area. It has proven to be very durable and easy to clean in an outdoor setting. The coloring is enough for the areas but not enough to overpower the area. The rug arrived quick and I absolutely love the colors. There was no foul smell i just unrolled it and put it out on my porch! The fact i could get this rug in a square shape was bonus! I thought that this rug was awesome when I got it. I love the colors and the style and the way it brought everything together on my patio, but it’s like a SPONGE when it rains. It takes forever to dry out, even in full sun. So if you’re putting it inside or on a covered patio, two thumbs up. In an area exposed to elements...DONT DO IT. This is a great rug because of the color and texture, but it SMELLS awful. Good thing we are using it outside. I think the smell will go away eventually, but we have had it three weeks and it hasn't subsided yet. It looks exactly like the photo. Bright colors and great design. I would buy it again. Waverly Sun N' Shade Bits and Pieces Seaglass Indoor/Outdoor Rug - 2'3" x 3'9"